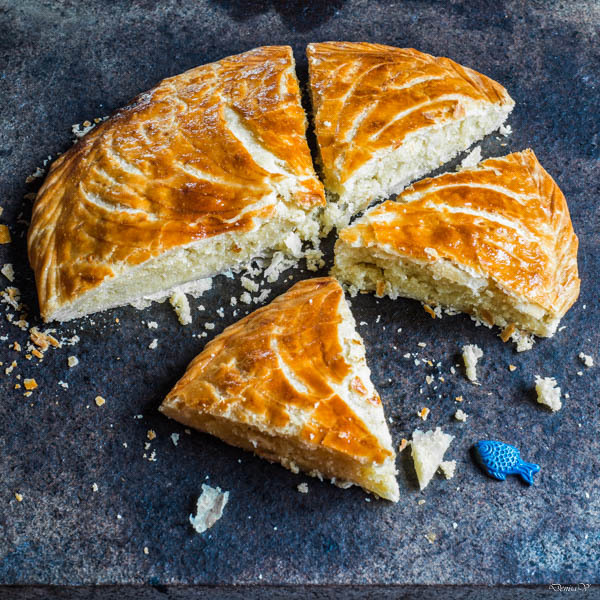 La galette de rois ... a traditional French cake that is eaten once a year, for the 6th of January. It is a cake with a little ceramic surprise in it. Find it in your slice and you'll be crowned as king. We are celebrating this in Belgium as well, so lets take each a bite. Cut 2 circles from the puff pastry using a plate. In a bowl, mix the almond powder, the sugar, the 3 eggs and the butter. Using a pastry bag put the almond mixture on the top of one of the round puff pastry sheet. Start from the center and go around until you leave 2 centimeters on the border. Hide the little surprise in the almond mixture by pressing it a bit down. Add the second round puff pastry on top and seal the border with your fingers. This is the reason why you need to let an empty border when you lay down the almond mixture. Beat the yolk and brush it on the top. Take a sharp knife and make a design on top with its blade. Bake at 200ºC for 45 minutes. Recipe inspired from Marmiton les meilleures recettes de pâtisserie et desserts de Marmiton, page 110.